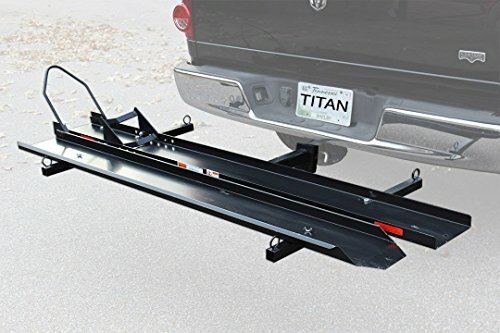 This Titan motorcycle ramp is the ultimate, all-in-one solution to hauling your sports bike- lightweight and offering up a range of transport options, this ramp covers a wide range of bikes. Once the carrier is attached, simply roll your sports bike onto the carrier with the provided ramp. The integrated cradle wheel chock helps center your sports bike. Size: 72" L x 7.5" W - Track length: 78.75"